Ultrasound imaging is often used together with xrays, however there are many times when investigating soft tissue structures, that ultrasound is able to give us more detailed information, and at times is the primary recommendation for imaging. Ultrasound is especially beneficial when we are trying to understand about texture and size of soft tissue structures, particularly in the abdominal cavity, but increasingly it is used to investigate heart problems, and can also be really helpful looking at tendons. It is particularly helpful for organs including the spleen, liver, pancreas, stomach, intestines, kidneys, and adrenal glands. Our veterinarians attend specialist training workshops, to continue upgrading skills so we can do more for your pets. This diagnostic modality is non- invasive and not painful in any way for your pet. Many times, it is possible to perform ultrasound investigations without anaesthetic. Frequently, only mild sedation is needed and sometimes nothing at all is required. Ultrasound involves placing a special probe in direct contact with your pet’s skin and usually requires clipping an area of hair. 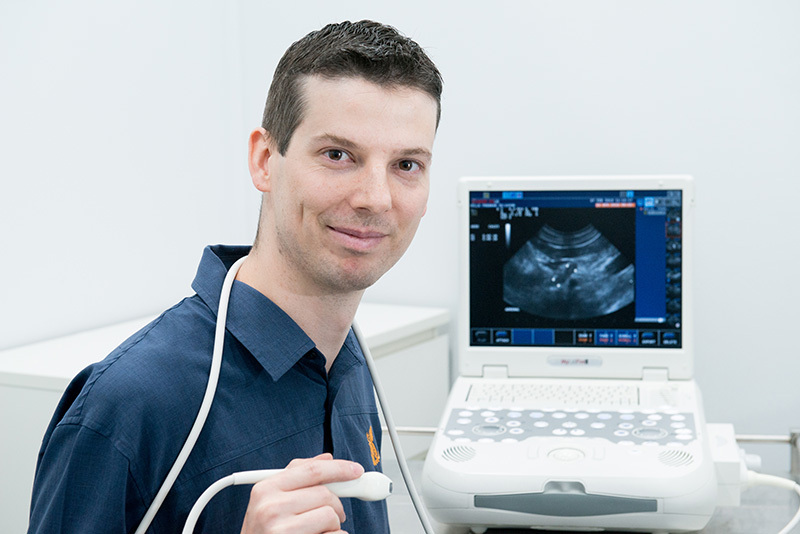 Please call the practice on 08 8362 6688 to discuss whether ultrasound may be an option for your pet.